Samsung Galaxy M10 and the Galaxy M20 received a good response among smartphone users. It was Samsung’s first ‘online only’ sale and the M-series smartphones sold within minutes of their availability. Samsung is bringing the heat back in the mid-range smartphone market with its Galaxy M30, which will be announced and launched in India soon. Some specifications of the Galaxy M30 had already been leaked online, but this time an image of the next phone in M-series has been leaked. It shows the design and features it will be sporting. Just like the older phones in its lineup (like the Samsung Galaxy M20) it too will have the infinity-V display with a water-drop notch on top and small chin bezel at the bottom. Unlike the other two M-series phones which sport TFT displays, the M30 might have an AMOLED display. Its screen size is likely to be of 6.38-inch with FHD+ resolution. The leaked image shows a triple camera setup at the back, which might be of 13MP + 5MP + 5MP combination. There might also be an ultra-wide angle lens and a telephoto lens in the back camera setup with LED flash. And the front camera might be a 16MP selfie shooter. There is also a finger-print scanner at the back, but there is no mention of 3.5mm headphone jack on the phone. The leaked image also shows a USB Type-C port. Similar to the Samsung Galaxy M10 and the Galaxy M20, which has big batteries the Samsung Galaxy M30 might come with a 5,000mAh battery. And unlike other phones in the M-series, which run Android 8.1 Oreo out of the box, it might come with Android 9.0 Pie from the get go. Talking about its processor, it might have the mid-range Exynos processor, the Exynos 7904. 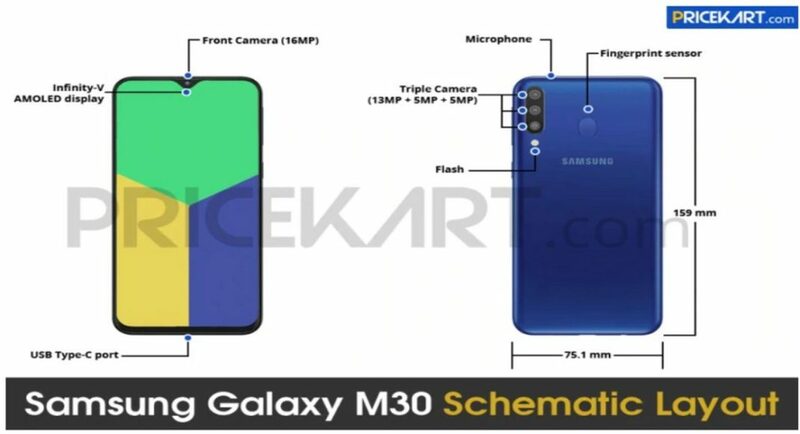 With the upcoming launch of the newest phone, Samsung Galaxy M30, in its M-series lineup Samsung wishes to dominate the low to mid-range smartphone market. And Samsung is planning to compete and take over the user base from the existing market players. Keeping the mid-range section in mind Samsung Galaxy M30 might be priced under Rs 20,000 mark in India, as it is targeted towards the younger audience. Samsung is also planning to launch a couple of their products in the Samsung Unpacked event later this month. And among them is the much-awaited flagship of the company, the Samsung Galaxy S10 which has been making headlines for quite some time now. So, we can assume that the M30 will be launched after the launch of the Samsung Galaxy S10. We can expect the phone entering the market around or after March 2019.